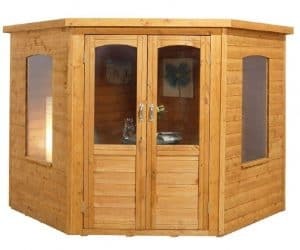 The 7×7 Sudbury Corner Summerhouse is one very smart looking corner summer house that despite its compact size offers more space than you would think. Even the more modest sized gardens will be able to happily fit this in. 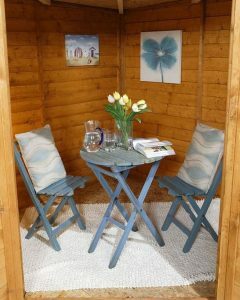 If you want a really modern and fun place to relax then this is the summerhouse for you. You can sit in here with a glass of wine and a good meal to help you relax after work. Or you could even use it as a place for fun where you kick back and enjoy the match in your very own man cave. The large double doors and those lovely windows do give it a lot of personality so it is going to be a very positive addition to any garden. The price may be low, but actually this is still a very well made corner summer house. The walls are 12 mm thick tongue and groove cladding which have a smooth design, but it is interlocked so well together that it is simply impossible for rain to get inside. Backing this up is a thick and robust frame that is going to keep the summerhouse standing strong for at least a couple of decades. 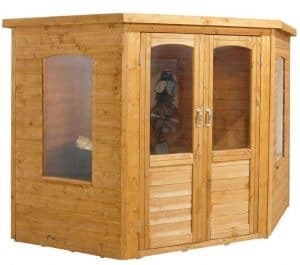 In all this is just a very well made summerhouse that is going to give you many years of use. Here we have one very stylish and cool looking corner summer house. 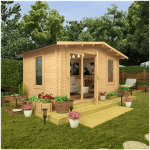 The 7×7 Sudbury Corner Summerhouse is a perfect summerhouse for those who want something that has a modern design and is not going to take up a whole lot of space. This would snugly fit into the corner of even a modestly sized garden. It is actually a little larger than you would think with the depth and width being 7 feet 6 inches. The height at the front is 6 feet 6 inches and at the back it is still a respectable 6 feet 1 inch. In all it is a very decent amount of room for a garden that cannot handle a large summerhouse. We really like the roof design they have gone for with this summerhouse. It is a flat pent roof which is going to force the rain to run off the back. This is something we always like to see as the last thing you want is rain running down the doors. They have used solid sheet boarding that is 8 mm thick and this is then covered with some dark roofing felt. In all they have done a good job with this roof. We feel that they have used the materials they have as a way to keep the costs down, but at the same time this is still a very decent roof. The 7×7 Sudbury Corner Summerhouse is actually a fairly low priced corner summer house so we kind of expected them to maybe make some sacrifices with the cladding. Well we are very happy to say that is not the case at all. They have used 12 mm thick tongue and groove cladding which as you can see is just gorgeous to look at. This cladding is also very, very strong and is able to keep the rain out no matter how hard it is battering it. On the inside of the summerhouse is a frame that is going to really ensure that even 20 years down the line that this summerhouse is still standing strong. The fact they have used a 35 mm x 28 mm frame was quite a surprise, but it does mean this is going to be one very robust structure. So if one of your little get togethers does get a little out of hand and your breakdancing sees you fall into the wall it will be fine. Well the summerhouse will be fine, your own wellbeing we really cannot guarantee. For the floor they have used the same kind of solid sheet boarding as the roof. Now this is fine and all, but we do wish they had opted for something a little easier on the eyes. Structurally the flooring they used will be fine. It is not as strong as tongue and groove boarding, but it will be able to easily take the weight of some chairs, a table and a few people. We just feel that they could have gone for a little nicer flooring. You can see in the pictures that they have a rug covering the floor and that is something we feel would work very well for you as well. As the 7×7 Sudbury Corner Summerhouse is only dip treated, wood treatment is going to be required within a few weeks of installation. It is always better to just roll your sleeves up and get it done sooner than later as you do not want the elements to give that smooth cladding a good kicking. Once a year a new coating should be applied. You do this and you will never have an issue with rot. This corner summer house as long as you look after it properly will be covered by a generous ten year anti rot guarantee. 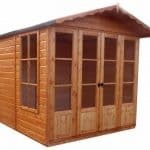 Just remember the guarantee is only valid as long as you treat the summerhouse properly. The doors really do have a great look to them. They are half glazed doors and we just love the framing they have used. Not just this, but the fixtures are also very attractive. 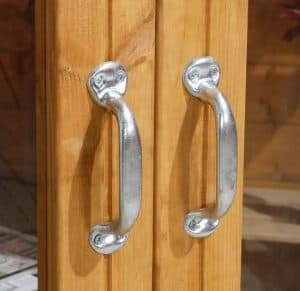 The doors have these great looking hinges and large handles that really does finish them off perfectly. The doors when open give you plenty of room to get in and out so even if you have larger items you want in here, you will not have to wrestle with them to get them inside. As well as the windows on the door there is another two windows on the summerhouse. These are made with 1.5 mm thick styrene so if you do have kids who like to kick a ball around the garden then you will not have any worries about broken glass. The windows have a great look to them and rather than just being rectangle they have a very subtle archway shape to them which we really like. At first glance you may think that you are going to have to buy some big metal chain and padlock combo that is strong enough to keep King Kong locked up to put round those door handles. Well actually you could do that if you want, but this is actually a pretty secure summerhouse thanks to the lock and key that it comes with. The windows while decent sized are not so large that you have a total lack of privacy with this summerhouse. If you did want to give yourself a little bit more privacy, then curtains, blinds or just a simple bit of fabric would work. 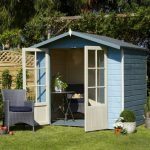 There are not any customisation options listed with the 7×7 Sudbury Corner Summerhouse, but we have a couple of ideas for you. First of all is the wood treatment. You can get wood treatment in many different colours these days, so have a think about maybe a red or blue kind of colour before you settle on the standard brown. Also you might want to consider some kind of laminate or even a large rug for the floor. This is actually quite a low cost corner summer house so we thought for sure they would have a ton of extras to tempt you with, but actually there is nothing. Which means you just pay for the summerhouse and they do not hustle you to spend your money on extras that you really do not need anyway. For what is really a budget priced corner summer house, they have done a very good job in making sure that the quality is still quite high. The framing and cladding are just first rate and if they had gone for a slightly stronger floor we would have maybe even gone as high as a 9. This is going to last you many, many years. Structurally this is good to go for at least 20 years, but the wood is going to need a little help from you in the form of a regular coating of wood treatment. 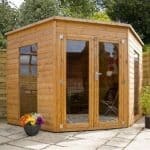 This is a compact sized summerhouse, but that does not mean you cannot make the space go a long way. With the right planning you are going to be able to fit a whole lot of furniture inside here. You and the person you trick into helping you out will not have any major problems with the installation. It is a pretty straightforward DIY job and as long as you have plenty of drinks, snacks and good tunes on the iPod, you are good to go. 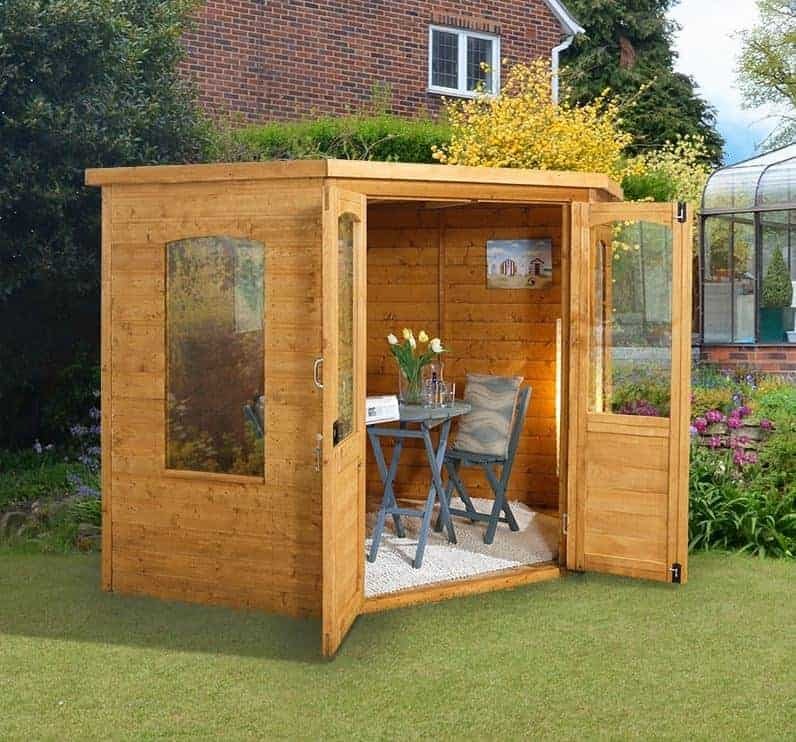 This is a budget priced summerhouse and we feel the asking price is actually very fair. 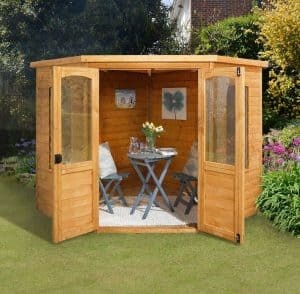 Final Thoughts: The 7x7 Sudbury Corner Summerhouse is a great summerhouse and ideal for those who do not want to spend a whole lot of money on a summerhouse. 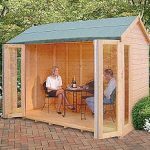 As this is a budget priced corner summer house a couple of understandable design choices have been made such as the solid sheet boarding, but this is still a very well made summerhouse that has some very cool style. We are sure that you are going to be able to enjoy this for many, many years and you are going to love the way it stands with pride in your garden. The price is fantastic and if you do want an affordable place to relax then this has to be on your shortlist.